As one of the leading eye-care centers in Louisiana, we’ve been providing successful treatments for the entire family, including children. Our pediatric doctors offer the most advanced treatments for pink eye,lazy eye, crossed eyes, and other common disorders. 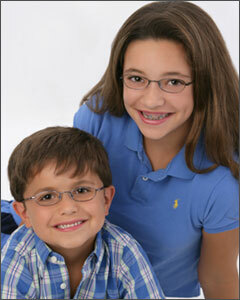 Visit us today to schedule your child’s eye exam, and have your children’s eyes tested. Kids should have their vision tested regularly as with adults. How does a child’s eyesight develop under normal conditions? Infants are able to see when first born, but eyesight improves with use during the first months and into the early childhood years. By the time a child is 9 years old, eyesight is usually fully developed and cannot be changed. This is why it’s very important to have eyesight checked at an early age. Sometimes called “lazy eye,” Amblyopia is poor vision or reduced vision in an eye that didn’t develop normally in childhood. The condition is common, affecting nearly 3 out of 100 people. It is easy to correct when found in infants or early in childhood. Strabismus (misaligned eyes): This is the most common cause. The crossed eye “turns off” to avoid double vision and the child uses only the better eye. Unequal Focus (Refractive Error): Refractive errors are simply eye conditions which are corrected by wearing glasses. Amblyopia occurs when one eye is out of focus because it is more near- or far-sighted or astigmatic than the other. The result of this unequal vision is that the weak eye “turns off.” Again, only the better eye is used. Cloudiness in eye tissues (which are normally clear) : This is often the most severe form and is caused by anything which prevents a clear image from being focused inside the eye. Childhood cataracts (cloudiness of the eye’s lens) can be one cause. How is Amblyopia diagnosed and treated? Unless there is a misaligned eye or other obvious abnormality, there is often no way to tell that something is wrong. Amblyopia is detected by measuring the difference in vision between the two eyes. There are a variety of tests which are performed observing the reactions of each eye as one is covered at a time. This condition is often treated by wearing a patch on the strong eye to force the weak eye to work. In some cases glasses may be prescribed or surgery is needed to correct the cause of Amblyopia.